Burmese ‘Red Amber’ BURMITE, first mined around 200BC, from the Hukawang Valley, Kachin Province. The Chinese believed it contained the ‘Soul of the Tiger’. Came to the Romans around 100AD, via the Silk Road. In 1917 it was discovered to be from the mid cretaceous period, 100 million years plus, making it the oldest known Amber and the reason why it is so hard and lustrous. Also of great interest to archaeologists, it is in fact a time capsule from a period when dinosaurs roamed the earth. This extremely rare necklace is from Mizoram, in the early 20th century, and was traditionally worn by various Hill Tribe groups of this region of NE India. The mines were closed in 1936, and may have reopened recently. 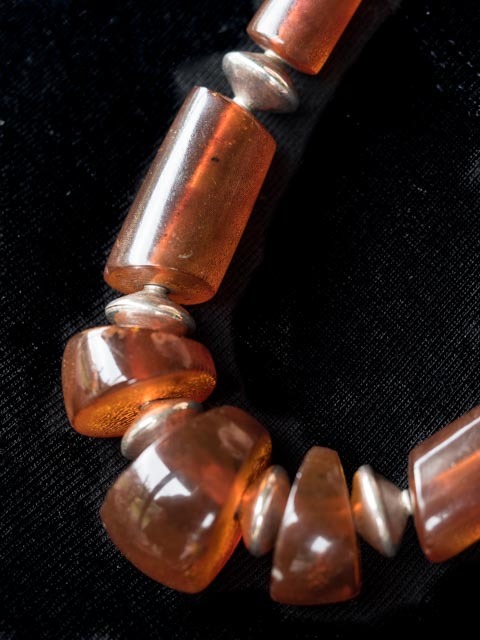 Widely regarded as the most collectable Amber in the world, this necklace is 65 cm long and weighs 86 grams.